Joy Creek Photo Archive (c) all rights reserved We received Lonicera crassifolia from The Elisabeth C. Miller Botanic Garden in Seattle where we first saw it draping out of a large container. We have grown this as a modest groundcover in our own gardens where it forms a dense layer of creeping stems that root as they travel. Our favorite application, however, has been to allow it to crawl down a wall where it forms an elegant branching pattern on the stone. 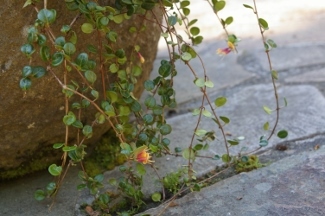 The small rounded leaves are glossy dark green with fine hairs. Surprisingly, the leaves turn burgundy in the winter. In spring, clusters of cream buds open into small honeysuckle flowers that turn a pleasing yellow in contrast with the red pink bases of the flowers. In the autumn you can find occasional small fleshy blue black fruits. June to July. 2-4 in. x Spreading.